Cancers in the brain are especially difficult to treat because a protective blood-brain barrier blocks the entry of most therapeutics. Researchers are investigating the use of new nanotechnology methods to carry therapeutics across the barrier. 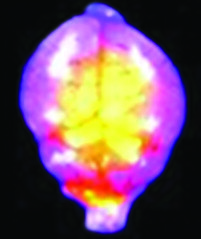 Here spherical nucleic acid (SNA) nanoparticles (yellow) carrying a therapeutic microRNA molecule were able to cross the blood-brain barrier of a mouse brain implanted with human glioma cells, a type of brain cancer.